The 1992 Monaco Grand Prix (formally the 50ème Grand Prix de Monaco) was a Formula One motor race held on 31 May 1992 at the Circuit de Monaco. It was the sixth race of the 1992 Formula One World Championship. The 78-lap race was won by Ayrton Senna, driving a McLaren-Honda. Drivers' Championship leader Nigel Mansell took pole position in his Williams-Renault and led until lap 71, when he suspected he had a puncture and made a pit stop for new tyres. He emerged behind Senna, closed up to the Brazilian and tried to find a way past but without success, Senna holding on to win by 0.2 seconds. It was Senna's fifth Monaco Grand Prix win, equalling the record set by Graham Hill. Mansell's teammate Riccardo Patrese was third, half a minute behind, with the top six completed by the Benettons of Michael Schumacher and Martin Brundle and the Larrousse of Bertrand Gachot. The team still hadn't made a proper seat for me, so I had taken a beating inside the cockpit, but I kept my foot down and desperately tried to remember where the next corner was. I knew the tunnel was taken flat out on my first lap but as I came back into daylight at 170mph, I was being bounced around so badly, I had double vision and I vividly remember speeding toward the tyre barrier wondering if I should turn left or right. Anyway I was called back to the pits and that was my run for the day. Perry McCarthy sums up his Monaco pre-qualifying session. The pre-qualifying session on the Thursday morning lasted for one hour and started at 8:00 local time, in warm and sunny weather conditions. Michele Alboreto ended up fastest in the session, gaining himself some extra track time. Bertrand Gachot also pre-qualified without drama and finished second fastest with a best time of 1:25.980. Roberto Moreno finished third fastest promoting the Andrea Moda team into the main qualifying session for the first time. Andrea Chiesa was the final pre-qualifier in fourth place with a best time of 1:27.756. Ukyo Katayama was slowed by a slight oil leak and only managed a 1:28.310 before crashing at Tabac in the final minutes of session, finishing with the 5th fastest time and becoming the only driver other than Roberto Moreno and Perry McCarthy to not pre-qualify in 1992. Perry McCarthy in his Andrea Moda S921 actually only managed two laps at the beginning of the session and subsequently did not record a time. The team wanted his Andrea Moda S921 car to be ready as a spare for his team mate Moreno, should he have needed it. Two practice sessions were held before the race; the first was held on Friday morning, with the second held on Saturday morning. Both sessions lasted 1 hour and 45 minutes. The first practice session took place under warm and hazy weather conditions. Andrea Chiesa's Fondmetal spins in front of Karl Wendlinger's March during the Thursday practice session. Chiesa failed to qualify as he finished 29th fastest, 0.715 seconds slower than Moreno's Andrea Moda. Riccardo Patrese finished Saturday qualifying second fastest despite being blocked by Bertrand Gachot in the final minutes of Saturday qualifying, resulting in a "paddock confrontation" between them. Michael Schumacher finished Saturday qualifying sixth fastest. I was really pushing hard and the car just didn't turn into the corner. I think something may have broken. It was a big shunt. I'm surprised I wasn't hurt. Jean Alesi had a spin in the session and was forced to use the spare Ferrari F92A on used tyres, however he still finished with the fifth fastest time. Michael Schumacher rounded out the top six with Andrea de Cesaris up in seventh place in the Tyrrell 020B. Having pre-qualified for the first time with Andrea Moda, Roberto Moreno continued to show improved speed by posting a 1:25.185 in the first twenty minutes, which put him 11th on the grid at the time despite Moreno's complaints of a "down-on-power engine". Moreno managed no further laps in the session due to overheating problems and slipped to 20th fastest by the end of Thursday qualifying. Andrea Chiesa had an engine changed on his Fondmetal GR01 during the session and started late, finishing with a best lap time of 1:27.140, the slowest time of Thursday qualifying. The weather conditions on Saturday were sunny and dry, but gradually became more overcast later into the afternoon. Within the first practice session on Saturday morning Pierluigi Martini crashed in the Monaco tunnel, causing damage to the barrier which took 40 minutes to repair and delayed the start of Saturday Qualifying by 30 minutes. Nigel Mansell went even faster on Saturday with a 1:19.495 and took his sixth pole position of the season. Mansell later described his time as a "totally clear lap". Riccardo Patrese improved to qualify second fastest, however he was held up by Bertrand Gachot on one of his qualifying laps, and reacted by heading over to the Larrousse pit and trying to punch the Frenchman. Ayrton Senna finished qualifying third on the grid despite spinning the rear of his car into the tyre barrier at the Mirabeau corner, damaging both his rear suspension and wing which eventually broke off in the tunnel as Senna returned his damaged car to the pits. Stefano Modena suffered a drive shaft failure early in the session and ran back to his pit to use the spare Jordan. In the spare car he failed to improve on his Friday time and dropped to 21st on the grid. Modena was the only driver who did not set a faster time in Saturday Qualifying. Following his crash in the morning Pierluigi Martini still took part in the afternoon session in the spare Dallara and qualified 18th fastest. Having finished 20th fastest on Thursday Roberto Moreno only managed to improve slightly on his Thursday time with a 1:24.945 due to "a string of mechanical problems" with the S921 chassis. With the circuit proving faster on Saturday Moreno fell to 26th place by the end of the session. Eric van de Poele set his fastest time in the final minutes of qualifying but just failed to make 26th place as he was +0.036 seconds slower than Moreno's Andrea Moda. Formula 1 journalist Joe Saward reported there was "rejoicing" in the Andrea Moda pit upon Moreno's qualification for the race. The conditions for the race were overcast, but warm and dry. The drivers took to the track on Sunday morning for a 30-minute warm-up session and Williams driver Ricardo Patrese finished fastest with Mansell down in fifth. Michele Alboreto performed strongly in his Footwork to finish the session second, but his team-mate Aguri Suzuki was sent to hospital for checks after crashing his FA13 at Tabac. The Japanese driver was later pronounced fit to race. The formation lap started at 15:30 local time. 26 cars qualified for the race, but only 25 took to the grid for the start as Gianni Morbidelli couldn't start his car during the warm-up lap and subsequently had to start from the pit lane. At the start, Senna passed Patrese into the St. Devote corner. Schumacher also passed Berger into the first corner. Pierluigi Martini also experienced his second crash of the weekend within the opening lap by running into the barrier on the exit of Mirabeau. The order at the end of lap one was Mansell in first, followed by Senna, Patrese, Alesi, Schumacher and Berger. Morbidelli joined the race a couple of laps down but only managed one lap before the gearbox again caused problems and forced him to retire for good. Roberto Moreno had moved up to nineteenth place thanks to the six earlier retirements but was forced to retire the Andrea Moda S921 on lap 11 in the pits due to engine problems with the Judd GV V10. Patrese began to attack Senna but then began to drop back with gearbox troubles. On lap 12, Schumacher tried to pass Alesi in the Loews Hairpin and the two collided, and an electronic box was damaged in Alesi's car. Alesi continued to stay in fifth for another 16 laps with Schumacher getting ahead of him, before the damage forced him to retire on lap 28, this promoted Berger to fifth. Brundle was chasing Berger, but he made an error in Nouvelle Chicane and not only suffered a puncture but also damaged the Benetton's front wing and had to pit for repairs, giving sixth place to Capelli. On lap 32 Berger had to retire when his gearbox failed. On lap 60 Michele Alboreto made a mistake and spun in front of Senna's McLaren-Honda, nearly causing a collision between them. In avoiding Alboreto's Footwork Senna lost nearly 10 seconds. Murray Walker: "Ivan Capelli. This won't of course have done his Ferrari position any good because although Luca Di Montezemolo, the Ferrari boss of both the passenger and the racing car divisions has said Capelli's position is safe; some of us doubted that statement and Capelli has gone off and out of the race, out of fifth position, out of a possible two points for the team"
James Hunt: "Some of us horrible cynics yes"
Ivan Capelli was running in 5th place despite having been lapped by Nigel Mansell, however on lap 61 he spun at Casino Square, damaging the steering arm. When he reached the swimming pool complex the damage caused him to spin and slide backwards wedging his Ferrari into barrier before Rascasse at a 45-degree angle. His retirement reminded the BBC F1 commentary team of the speculation regarding his future with Ferrari, which had been prominent before the race weekend. Nigel Mansell led the race in his Williams FW14B-Renault up until lap 70, but then suffered a loose wheel nut and was forced into the pits, emerging behind Ayrton Senna's McLaren-Honda. Mansell, on fresh tyres, set a lap record almost two seconds quicker than Senna's and closed from 5.2 to 1.9 seconds in only two laps. The pair duelled around Monaco for the final three laps but Mansell could find no way past, finishing just two-tenths of a second behind the Brazilian. It was Senna's fifth win at Monaco, equalling Graham Hill's record. Ricardo Patrese took the final podium position after just holding off Michael Schumacher's Benetton who finished fourth. Ayrton Senna with Prince Rainier and Princess Stephanie. The top three finishers appeared in Prince Albert II of Monaco's Royal box to collect their trophies and in the subsequent press conference with Tony Jardine asking the questions. Senna admitted he knew the Williams car was "several seconds faster" than him in the last few laps and his tyres were like "driving on ice" due to having completed the whole race on the same set. I must compliment Ayrton because he pretty well second guessed every move I tried to do and he was very fair and he is entitled to do what he did and I think he drove fantastic and that's why he won the race I came a close second. Coming into the tunnel I almost lost it, the back end just went down and I knew immediately I had picked up an instant puncture. The problem was I was halfway from the pits. So I had to drive so slowly to get to the pits. The car's brakes weren't working because I was only on three wheels. I think I lost 10–15 seconds just getting it back to the pits. We then had a longer pitstop than normal and as I came out of the pit I saw Ayrton go by, and I knew then that the race was probably lost, but as you can see from the last 10 laps we gave it everything we could and more and his car was just too wide to get past. Despite initial reports that Mansell incurred a puncture in the tunnel on lap 71 Goodyear later denied this was the case. Williams engineer Adrian Newey later speculated the problem had "perhaps" been caused by a "loose wheel nut". I will remember forever going out to pre-qualify the Andrea Moda in Monaco. The tyres in those days would do their best laps around the fifth or sixth laps. For us, after the fourth lap, the engine would overheat, because we didn't have cooling big enough! We could never run that long. The engine would overheat, and the oil would be too hot. I had to stop on lap 4, to not blow the engine up. So I had given it my max in pre-qualifying before I even got the best use of the tyres. It was enough to get through stage one, and the first hurdle was overcome. I got to qualifying, and I went out early in the session. In Monaco you always get the best times in the final laps, but I put the car 11th in the first twenty minutes, that was all the laps I could do. Coming into the pits, every team was out in the pits clapping at me, and that will stay in my memory forever. Suzuka 1990 was obviously a great memory, but in achievements? Qualifying an Andrea Moda is up there as well. In a feature on the BBC's Formula 1 Website in 2009 former BBC Formula One commentator Murray Walker ranked the 1992 Monaco Grand Prix as one of the five "best ever" Formula 1 races due to what he described as the "absolute magic" battle for the lead in the last three laps between Senna and Mansell. ^ "Motor Racing Programme Covers: 1992". The Programme Covers Project. Retrieved 21 February 2018. ^ "Ivan The Terrible". F1 Rejects. Archived from the original on 10 August 2004. Retrieved 26 January 2016. ^ a b Dodgins, Tony (28 May 1992). "A new shake up at Ferrari – or is it idle speculation". Autosport. Haymarket Publications. 127 (9): 6. ^ Dodgins, Tony (28 May 1992). "Team Lotus". Autosport. Haymarket Publications. 127 (9): 9. ^ Dodgins, Tony (4 June 1992). "Team Lotus". Autosport. Haymarket Publications. 127 (10): 7. ^ McCarthy, Perry (2002). Flat Out, Flat Broke: Formula 1 the Hard Way!. Haynes Publishing. p. 197. ISBN 1-85960-886-8. ^ a b c d e f g h i j k l m Saward, Joe (4 June 1992). "Monaco GP". Autosport. Haymarket Publications. 127 (10): 39. ^ a b c d e f g h i Saward, Joe (4 June 1992). "Monaco GP". Autosport. Haymarket Publications. 127 (10): 37. ^ a b c d e f Saward, Joe (4 June 1992). "Monaco GP". Autosport. Haymarket Publications. 127 (10): 28. ^ "F1 Rejects Interview with Perry McCarthy". F1 Rejects. 1 June 2004. Archived from the original on 5 June 2011. ^ a b "Qualifying". Manipef1. Archived from the original on 7 April 2014. ^ Saward, Joe (28 May 1992). "Monaco GP". Autosport. Haymarket Publications. 127 (10): 36. ^ a b c Hallbery, Andy (18 April 2011). "Roberto Moreno: "Qualifying an Andrea Moda is up there as well"". Motorsport Retro. Archived from the original on 11 October 2014. Retrieved 10 January 2016. ^ a b c d e f "Grand Prix Results: Monaco GP, 1992". Grandprix.com. Archived from the original on 23 June 2011. Retrieved 21 July 2011. ^ Allard Kalff (Commentator) (30 May 1992). Monaco Grand Prix: 2nd Qualifying Session Live (Television production). London, England: Eurosport. ^ a b Monaco Grand Prix: 2nd Qualifying Session Live (Television production). London, England: Eurosport. 30 May 1992. ^ Saward, Joe (4 June 1992). "Monaco GP". Autosport. Haymarket Publications. 127 (10): 31. ^ a b Walker, Murray (Commentator); Hunt, James (Commentator) (31 May 1992). Grand Prix -race live. BBC Sport. Monaco: BBC. ^ Henry, Alan (1992). 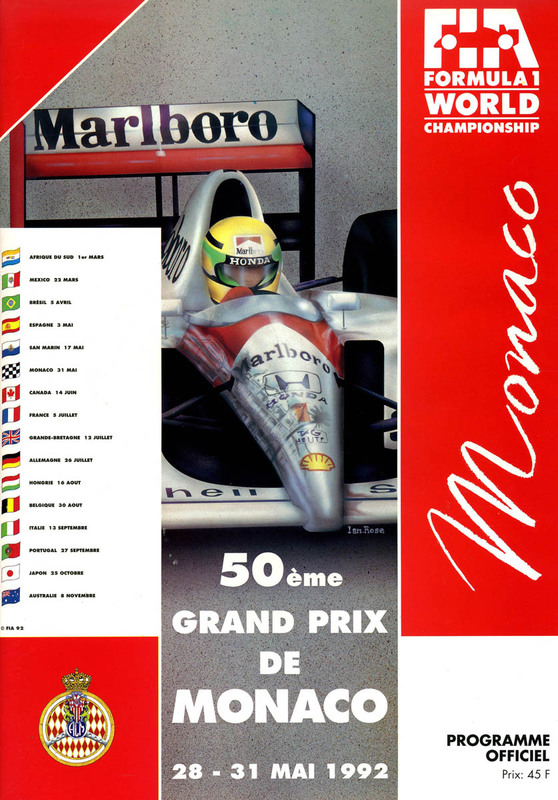 "1992 Grands Prix: Monaco Grand Prix". Autocourse 1992–93. Hazleton Publishing. pp. 150–153. ISBN 0-905138-96-1. ^ a b c d Monaco Grand Prix: Race Live (Television production). London, England: Eurosport. 31 May 1995. ^ a b Roebuck, Nigel (4 June 1992). "Monaco GP". Autosport. 127 (10): 34. 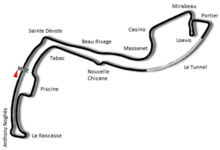 ^ "Murray Walker's "Five of the Best" GPs – Monaco 1992". BBC Sport. BBC. 6 March 2009. Archived from the original on 7 April 2014. ^ "Scoreboard: Motor Sports: Monaco Grand Prix". Press and Sun-Bulletin. 29 May 1992. p. 2C. Retrieved 24 January 2018 – via Newspapers.com. ^ Jones, Bruce (2000). "The Drivers World Championship". The Complete Encyclopedia of Formula One. Carlton Books. pp. 537–538. ISBN 1-84222-116-7. ^ "1992 Monaco Grand Prix". formula1.com. Archived from the original on 3 November 2014. Retrieved 23 December 2015. ^ a b "Monaco 1992 - Championship • STATS F1". www.statsf1.com. Retrieved 19 March 2019. Wikimedia Commons has media related to 1992 Monaco Grand Prix.